I am posting this as proof. Proof that at Wegmans people open boxes of butter and buy only one stick leaving the others behind. Despite the crazy looks Tina and I got from the cashier at the Jamestown Wegmans, it is in fact a common practice at the East Ave Wegmans. Proof. They do it with eggs too. What!? If you didn't have proof I wouldn't believe you! How does the cashier ring up one stick of butter or 1 egg? Could get hit by a bus the next day, and then you'd just be a sucker who paid for eggs and butter you didn't use! For eggs, they don't take individual eggs... the cartons get cut in half and you can buy a half dozen. This is a strange phenomenon...Ive never seen this happen...with butter? Seems unsanitary...since butter is just wrapped...not really wrapped for individual sale. I worked at a Syracuse area Wegmans for 10 years and we allowed this as well. The cashier had codes for 1/2 eggs, individual sticks of butter. I don't know if they still do it, as I haven't seen stray butter sticks or eggs in awhile. Lisa - good to get the inside scoop on that. I didn't realize there were places you couldn't do this. Weird. 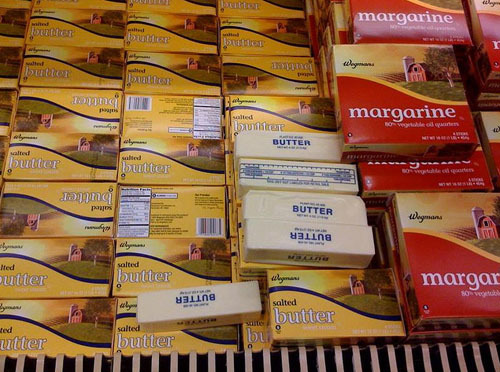 I've seen 1/2 cartons of eggs, but never single sticks of butter! I thought this was crazy, but right after reading about it I heard them talking about the exact same thing on a sitcom. Guess you learn something new every day!